Just regular folks. : Gram postitive/gram negative. So in order to start nursing school in the fall, I need to have two more pre-reqs which I'm racing to finish. Two intensive summer courses, squished into one month of craziness. I spend today in lab staining bacteria. This is all stuff that I think I should have done before, but I don't really think I've done before. Lots of stain on my fingers because the community college is too cash strapped to provide gloves. The summer students tend to often be kids from other colleges working on classes here because they are cheaper or because they want to have the pre-reqs for going to medical school. 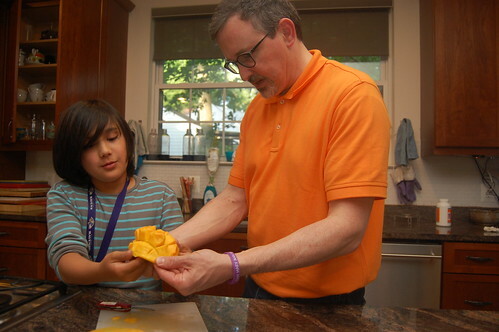 And because it's not a blog post without a photo, here's a photo of us getting ready to eat a mango.